Plumbing Repairs can be quite inconvenient, most of the time they come as a surprise, and definitely not the good kind. Usually you can’t prepare for a Plumbing problem to arise, however, you can prepare for a solution by keeping our number handy. Because Plumbing issues can cause so much difficulty let Rooter Right Plumbing make the solution easy. 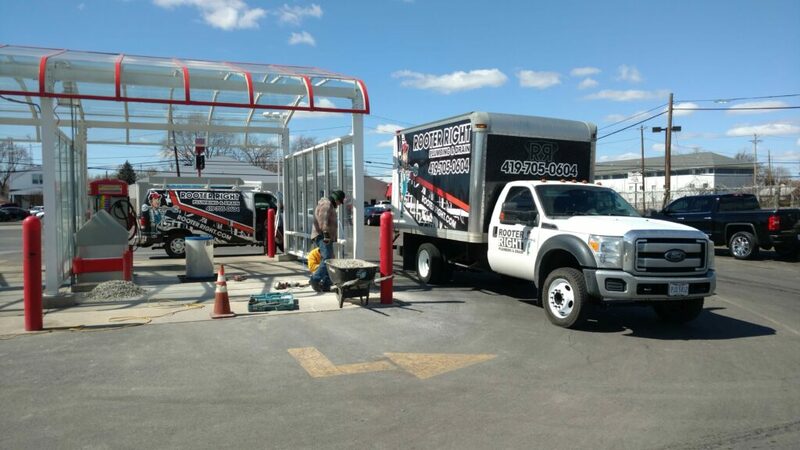 You’re in good hands; we have the years of experience and on the job training it takes to quickly diagnose, estimate, and complete any Plumbing Repair(s). The water main is a vital lifeline of any home or business. An interruption of water service can greatly affect the functionality of a building. This applies especially to businesses that rely heavily on a steady supply of on demand water, both hot and cold, to keep their business functioning. Lack of water also prevents toilets from flushing creating the potential for health hazards. Most don’t realize how heavily dependent on water our living and workspaces are. So, when your water supply is threatened by leaks or breaks contact Rooter Right Plumbing to send an Emergency Service crew to your home or business to assess the situation and immediately begin the process of restoring water. We look at each job individually and give recommendations based on our findings. In some cases, making repairs is the sensible thing to do, in others, total replacement is necessary. When a leak or break has been detected in your water service line there are a few factors to consider before deciding how to proceed. First, the type of pipe used must be identified; we need to know if the pipe is copper, galvanized, or some type of plastic. Second, the location of the break must be identified to determine how accessible that portion of the pipe is. Is the break outside the structure where an excavator can be brought in to expose it, or inside the structure buried under a crawl space or concrete slab? Depending on these two important variables we can decide whether it is best to repair the line or replace it entirely. If repairing, the line will be excavated and exposed where the leak is believed to be located. The bad section of pipe will be removed and a new piece will be coupled to the existing line. 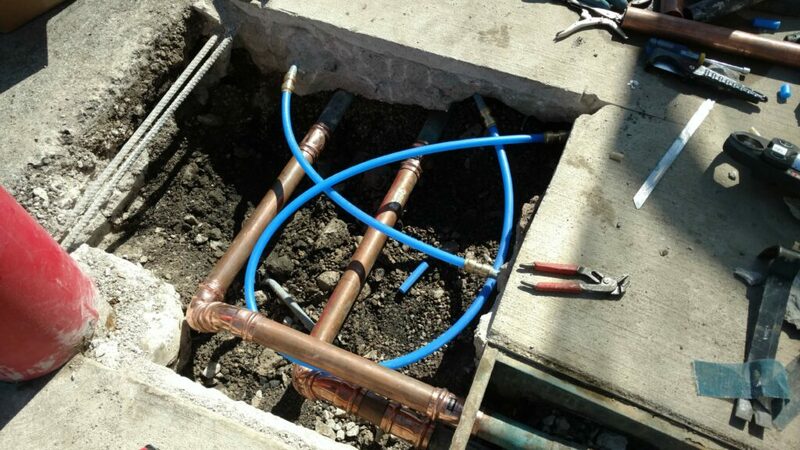 Once the repair is complete the line will be pressurized to ensure the leak has been eliminated, if so, the line can be buried and the job is complete. 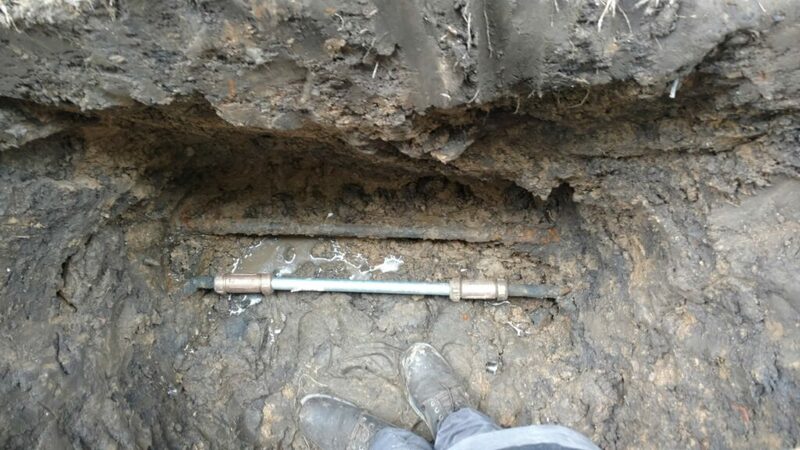 When excavation of a Water Main proves extremely difficult or the line has deteriorated too much to be repaired, it may be time to consider replacement. 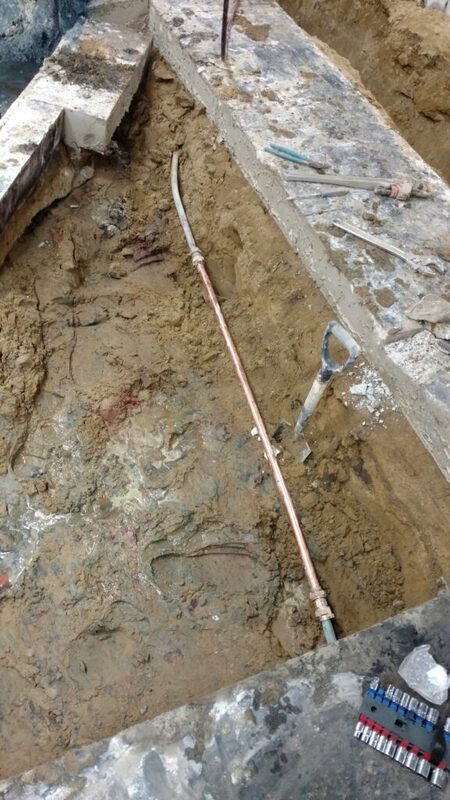 For those with old galvanized water mains, it may be time to upgrade to either a Copper or Plastic water main supply. Galvanized Water Lines rot from the inside out, so what may look like a descent pipe on the outside may be highly corroded on the inside. This corrosion can also cause pressure issues as the rust and mineral deposits start to build up and restrict the flow of water. For Water Lines that run underneath areas that are too difficult to excavate, Directional Boring a new waterline may be the best solution. With directional boring, a hole is drilled underground from the city tap to the point inside the home or business where the water meter is located. Once the drill has bored from one end to the other, flexible pipe is pulled back through the hole as the machine backs the drill out. This line can be ran directly under houses, crawl spaces, roads, and anything else that might hinder excavation. New lines can be installed in excavated trenches as well. Each job has different circumstances that generally dictate the best method for repair or replacement. Either way, Rooter Right is willing and capable of proposing and executing the best solution. Leaking pipes are a common issue for any Plumbing System. No matter what material your pipe is or what purpose it serves, over time, there is always potential for leaks. Whether it’s potable water, natural gas, drainage, compressed air, or any other medium, leaks can happen. There are a number of methods and techniques for locating leaks wherever they may occur. Some are more difficult to find than others but regardless, we have the equipment, experience, and know-how to isolate and expose any leak. Don’t put that leak on the back burner. If you think you have a leaky pipe it is best to address it right away rather than risk the leak turning into total failure or causing damage to the surrounding structure. Low Water Pressure can be the result of one underlying cause or the result of a number of contributing factors. Either way, restoring proper pressure is accomplished through a process of elimination. This process begins at the Water Main coming into the home or building. From there we work our way through the system in an attempt to identify the cause, or causes. Some common contributors to low pressure include: Calcium build-up in faucets and fixtures, restriction of flow due to corrosion, partially open/closed valves, and in the case of first generation pex fittings, zincification. Regardless of the cause, we have the ability to identify the problem and correct it. This may be a simple process, such as clearing calcium debris, or a more involved process, such as replacing old corroded lines with new.